The Scottish Government today launched its consultation on the Independence referendendum. (The Westminster crowd have also started one [PDF], but I have a feeling the former will be more important to participate in.) You don’t need to live in Scotland to participate, so do tell them what you think! 4.1 Following a vote for independence, the Scottish Parliament and Government would carry forward the people’s will. This would involve negotiations with the UK Government. These negotiations would deal with the terms of independence as well as with the arrangements for the transition. The terms of independence would include agreement on the scope and arrangements for future cross-border bodies and cross-border co-operation, both transitional and ongoing. 4.2 Formal negotiations would also be opened on Scotland’s international responsibilities, in the European Union and more widely. Other bodies such as relevant international partners would be involved in such discussions as needed. 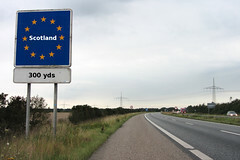 4.3 Agreement on the arrangements for transition would allow Scotland to move forward to independence. There would be a transitional period to allow for necessary legal and practical preparations. These preparations would ensure that systems and arrangements were in place to allow an independent Scottish Parliament and Government to fulfil the full range of their responsibilities from the moment of independence. 4.4 The final requirement for independence to have effect would be for both the Scottish and UK Parliaments to pass and bring into force independence legislation which would enact the negotiated settlement. In particular, the legislation would effect the transfer of the power to legislate for Scotland from the UK Parliament to the Scottish Parliament and would define the effective date of Scotland’s re-establishment as an independent, sovereign state. 4.5 May 2016 will see the election of the next Scottish Parliament which would become the Parliament of an independent Scotland. This election will give the people of Scotland the chance to decide the future policy direction of Scotland. Frustratingly, but predictably, there are no time scales. I guess such negotiations can’t be rushed too much, and some of them will be hard. The Slovak parliament adopts the Declaration of independence of the Slovak nation. The Federal Assembly passes an act that dissolves Czechoslovakia on 31 December 1992. The Czech and Slovak Republics are admitted to the UN as new and separate states. Separate currencies are introduced, at first at par. The telephone country code +42 is replaced by two separate codes: +420 for the Czech Republic and +421 for Slovakia. It should be clear from the above that the process can be quite fast if both sides work together constructively on the task.